Can you confirm these amateur observations of Diplodactylus conspicillatus? Type locality: Charlotte Waters, Northern Territory. Diagnosis Diagnosis. A large member of the D. conspicillatus group (max SVL 62 mm) with a bold canthal stripe and a greatly enlarged first supralabial (contacting ventral edge of nasal scale. Mid-dorsal scales on trunk plate-like and markedly larger than smaller dorsolateral scales. Scales on nape granular and only slightly larger than granules on side of neck. Original tail spade-like and lacking an acute attenuated extension at tip. Scales on dorsal surface of tail ar- ranged in transverse rows (which usually include rows of both large and small scales). Pattern generally spotted and often with numerous dark blotches that contrast strongly with base col- our (Fig. 7A–B in OLIVER et al. 2014). Comment Synonymy: Diplodactylus hillii LONGMAN 1915, D. platyurus PARKER 1926, and D. laevis STERNFELD 1925 have been removed from the synonymy of D. conspicillatus and revalidated by OLIVER et la. 2014. 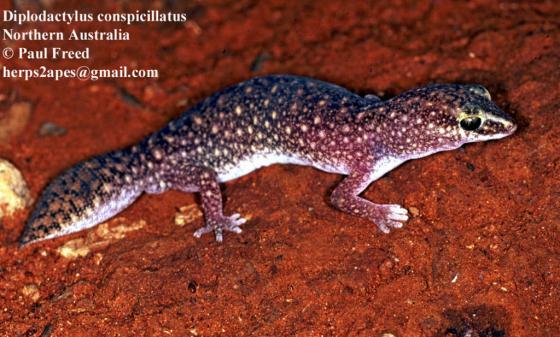 Group: (founding) member of Diplodactylus conspicillatus group. Abundance: common, with more than 500 specimens collected (Pianka 2011). However, the D. conspicillatus species complex was split up into multiple species and several synonyms revalidated by OLIVER et al. 2015. Longman, H. A. 1915. Reptiles from Queensland and the Northern Territory. Memoirs of the Queensland Museum 3: 30-34. Parker, H. W. 1926. New reptiles and a new frog from Queensland. Ann. Mag. Nat. Hist. (9) 17: 665-670.